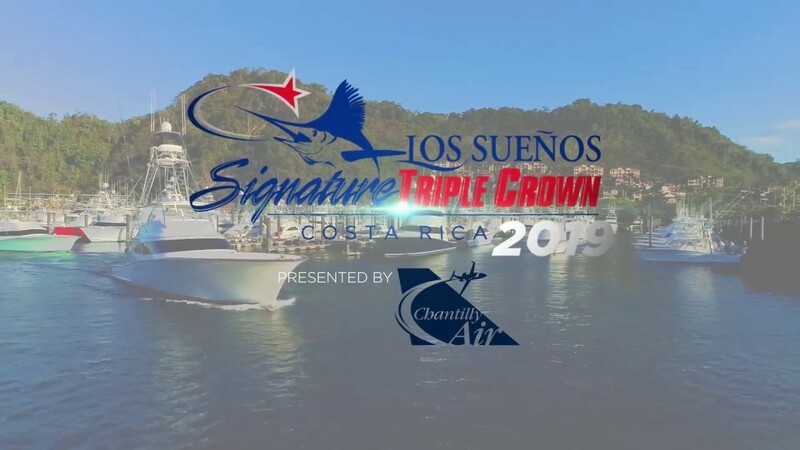 WELCOME TO THE 2019 LOS SUEÑOS SIGNATURE TRIPLE CROWN! We are thrilled to invite you to participate in the SIXTH ANNUAL Los Sueños Signature Triple Crown. Together with our presenting sponsor, Chantilly Air, we look forward to celebrating yet another year of exciting competition. Scroll down for more information, including this year’s dates, our sponsors, the schedule of events, and more! Click on the button to download the printable PDF registration form and email the completed document to a.bretecher@lossuenos.com, with a copy to tmueller@lossuenos.com. 5 pm – 7:30 pm | Dockside buffet and open bar. Scorecards must be handed in by 7 pm. We thank all our sponsors for their support and invite you to discover how they can support you. Presenting sponsor of the 2019 Los Sueños Signature Triple Crown, CHANTILLY AIR, is an Aviation Services Company providing Aircraft Maintenance, Charter, Management, Storage, Ground Support, and Aircraft Sales and Acquisitions. Los Sueños Costa Rica provides a luxury gateway to incredible inshore adventures and the best offshore marlin fishery in the world. Chantilly Air is an Aviation Services Company providing Aircraft Maintenance, Charter, Management, Storage, Ground Support, and Aircraft Sales and Acquisitions. Galati’s product knowledge and experience is unparalleled in the yachting industry. TUNASKIN is committed to being a leader in the aquatic sports industry. Maverick Sportfishing Tours is committed to having the most professional charter boats with the best equipment and crews in all of Costa Rica. Sevenstar is the world’s leading provider of yacht transportation services on a lift-on, lift-off basis. Costa polarized sunglasses and polarized prescription sunglasses for those who were Born on the Water. Always watching, never seen. State of the art boat alarms and monitoring systems. A HUCK bucket is designed to perform, made from performance polymers and built to last. It’s a five-gallon bucket on steroids. Since the introduction of the first Seakeeper, we’ve seen and heard thousands of times how Seakeeper has changed people’s lives. Visit us at the Los Sueños Marina Village. We specialize in marine electronics, air conditioning, installation of Seakeepers, and more. FishTrack offers global satellite imagery and marine weather – all in one tool. Locate temp breaks, eddies and more. Receive an accurate 16-day wind and wave forecast for any offshore point. Buoyweather Premium provides access to the most reliable, point-based forecasts available. Building a better boat every day has been Viking’s philosophy for over five decades. Poms & Associates. Reducing risk is our business. Sharing knowledge is our strength. Serving you is our passion. The only official video production company of Los Sueños Tournaments since the tournaments started over a decade ago. Visit our branch, located next door to BLP Legal at the Marina Village, to ask about our services. Need cash? Our ATM is located beside the Los Sueños Marina Office. Sophistication and style pair well with the beautiful rainforest for your getaway at Los Sueños Marriott Ocean & Golf Resort. For more than 25 years, VanMark Jewelry has been designing and crafting beautiful works of art using only the finest precious metals and gemstones. Flor de Caña is a naturally aged rum enriched by the unique properties of the San Cristobal volcano, the most active in Nicaragua. Our attorneys are innovative and proactive, understanding the needs of the client in the ever-changing and highly dynamic corporate world. Located next to the Los Sueños fuel dock, Bristol Marine Supply is a one-stop shop for all your tackle and boating needs. Established in 1985 with two employees and a sewing machine, Canvas Designers® has since evolved into the largest custom marine canvas shop in the world. Caterpillar is the marine industry’s leading provider of medium- and high-speed marine diesel engines, generator sets and auxiliary engines. Our attention to service and quality has made us an industry leader. The customer always comes first and we constantly strive to exceed your expectations. D-Dey Response Group has elite training solutions for everyone, at any stage of learning. From first responders and medical professionals to the, “could be” civilian rescuer, D-DEY has a full spectrum of training curriculums. The world’s best offshore fishing content – print and digital. Our mission is to entertain and inform big-game fishermen.